Should You Read The Bible in 90 Days? What You Need To Know! Have you chosen your guided word for 2019? Or are you among the thousands of individuals who failed at their new year resolution only after day 2? Yeah that’s me! Well last year it was. You see, the problem with most New Year Resolutions is that we make them without really developing a plan to execute and remain accountable to our goals. We randomly select goals because that’s just the thing to do at the start of a new year. The result, by the end of January our goals are just another statistic. If your goal this year is to grow in faith, then you are in the right place. This week on the blog, we will discuss should you read the Bible in 90 days, plus some ideas to encourage growing in faith this year! Disclosure: This post may contain affiliate links, which means we may receive a commission if you click a link and purchase something that we have recommended. While clicking these links won’t cost you any extra money, they will help us keep this site up and running. Please check out our disclosure policy for more details. Thank you for your support! 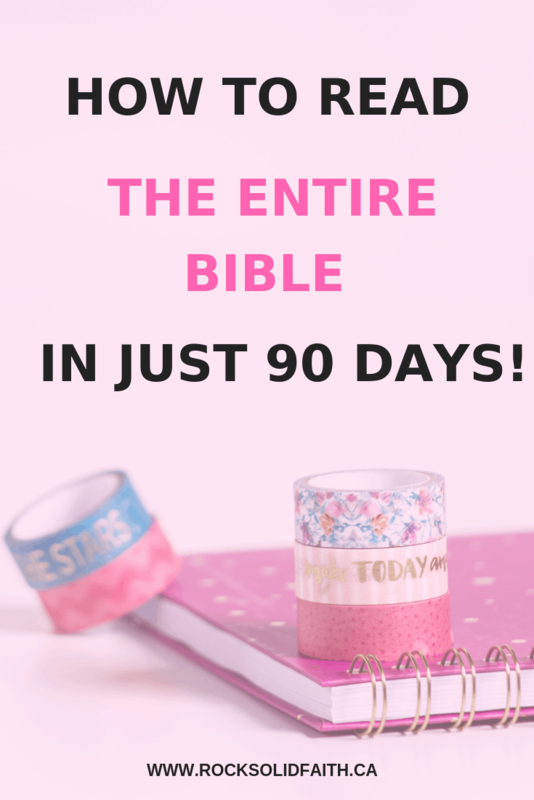 Why Read the Bible In 90 Days? When I first told my husband that I wanted to read the Bible in 90 days, he just couldn’t understand it. Why 90 days he questioned? At the time I couldn’t think of an answer. Truth be told, everybody was doing it so I wanted to do it too. Yeah I am a crowd follower. At least it was for spiritual growth. Does that at least score some brownie points? Truly connecting with your why, your motivation, is what will keep you chugging at your goal even on days when you are exhausted or just want to call it quits. Are you reading the Bible in 90 days just because everyone else is doing it? Or is it just an arbitrary goal? Reading through the Bible in 90 days gives you an excellent overview of the Bible. Once you have completed your Bible in 90 days reading plan, you can always follow-up with more in-depth studies of the different books of the Bible. There is a popular saying that “you can’t know where you are going if you don’t know where you are coming from.” Whoever penned those words knew what they were talking about. One of the reasons why my goal to read off the Bible in 90 days originally failed, was that I just wasn’t being realistic. At the time, I found it challenging to read two chapters of the Bible before suddenly feeling weary. How then could I remain committed to reading large chunks of the Bible in one sitting? Use your past failures to help you realistically develop a plan of action for future success. Think about why you struggled with reading the Bible in its entirety in the past. Was it that you struggled to find the time or perhaps you became overwhelmed by the volume of daily readings? Whatever the reason, adjust your goals accordingly. This may mean switching to a plan you find a bit more manageable and can remain committed to. Reading the Bible in 90 ways will require you to read large chunks of the Bible on a daily basis. This can quickly start to feel like a never ending chore and result in you quitting just a few months in. Be reasonable, take your situation into account to determine whether reading the Bible in 6 months or a 52 week Bible reading plan would be a better option for you. If you are looking for a Bible in 90 days app, consider the Bible in 90 days reading plan available from the YouVersion Bible App. 52 Week Bible Reading plans are also available in their growing resource library. Having the reading plan on your phone allows you to easily keep track of your progress on the go, no printed bible reading plan required. 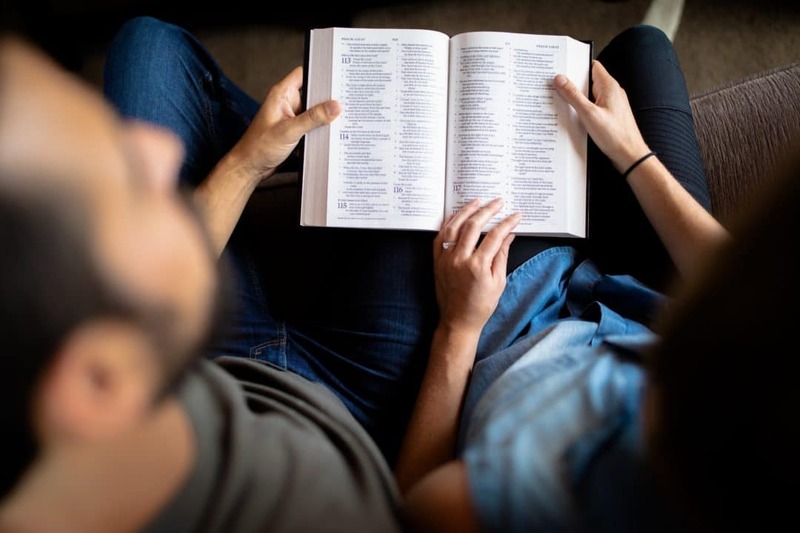 The Bible reading plan can also be done individually as well as with family or friends. Inviting friends or family to be a part of the reading plan can help to keep you accountable and be able to discuss the readings with each other as you make your way through the Bible. 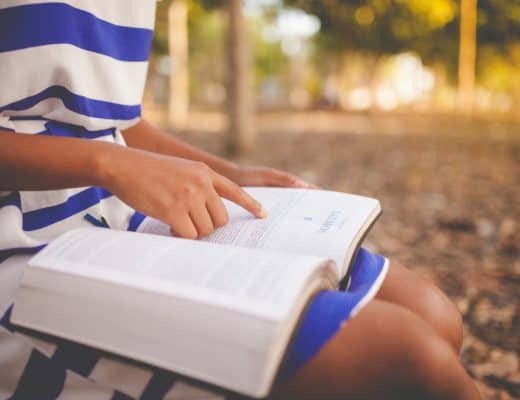 There are various reading plans available online that allow you to read the new testament in 90 days or even read the old testament in 90 days. Only 10% of Christians have actually read through the Bible. Sadly, according to a 2004 Gallup survey only 37% of teenagers could identify a quote from “The Sermon on the Mount.” As you read the Bible in 90 days, be prepared for a transformation. To reinforce your readings, try some of these helpful tips mentioned below as you read the Bible in 90 days. The Bible Project is a non-profit organization that produces short animated Biblical videos. Their videos summarizes books of the Bible as well as point out the overarching themes. Once you have completed a book of the Bible, you can watch the corresponding animated video from The Bible Project. It not only helps with recalling what you read earlier but can also provide perspectives you may not have considered while reading through the book. You can find a compilation of the Bible Project videos on their YouTube Channel. Switch up your daily Bible reading routine by watching a Visual Bible Project. This isn’t a Biblical movie that includes lots of Hollywood theatrics. Instead, the films are verbatim and developed from books of the New Testament. Thus far I have come across: The Visual Bible: Matthew, The Visual Bible: Acts and The Gospel of John. You can find copies of the videos on Amazon. You can also consider adding a dramatized audio Bible translation to your reading mix. A dramatized audio Bible can help bring your readings to life. While somewhat cheating here a bit, I like listening to audio versions. I find this convenient as I can listen to the Bible during my commute to and from work. The app I use for this is Bible.is. I find Bible.is rather convenient as I can listen to the bible on the go without exceeding my allotted data. All you have to do is to download the audio and text versions at home then you are good to go. A neat way of still listening to God’s word without blowing through your monthly data allotment. If Instagram or Pinterest is your jam, you would have likely come across artistic Bible images in your feed or heard the term Bible Journaling. Bible Journaling is simply meditating on scripture creatively through methods such as art, paint, stamps or even stickers. Not only is it a creative outlet, but it allows you to mediate on God’s words in a fresh new way. New to Bible Journaling? Download a free Bible Journaling Kit with step by step instructions and tips to get started. Whether playing with friends or even the Kids, Bible games are a fun way to learn God’s words while having fun. Psalms 119: 11 says, “I have hidden your word in my heart that I might not sin against you.” Memorizing scripture helps to guard us from temptation and help us to live in accordance with the word of god. Even Jesus regularly memorized and quoted scripture. You can try scripture memory games to help you commit God’s words to memory. Hebrew and Greek were among the original languages of the Bible. You can gain a deeper understanding of scripture by reading the Bible in its original language. Consider enrolling in courses or even borrowing books from your local library to help you in learning Biblical Hebrew and Biblical Greek. 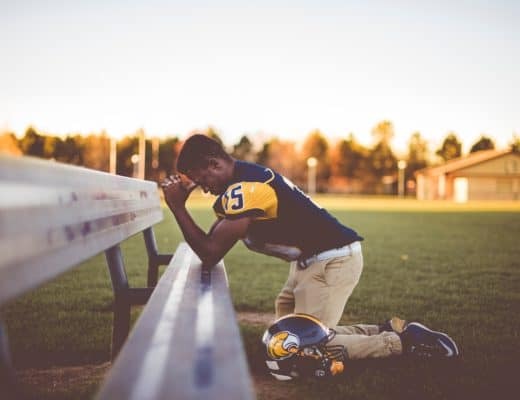 Proverbs 22:6 says, ” Train up a child in the way he should go; even when he is old he will not depart from it.” As parents its our duty to help point our kids to God. While its a wonderful achievement to read the Bible in 90, we shouldn’t forget about our kids spirituality as well. Bake through the Bible is a wonderful way to bond with your kids while including stories with a strong gospel message. This is exactly as the name suggests. Writing scripture allows you to further mediate on the word of God as well as reinforce what you read aiding in scripture memorization. Scripture Writing can help you to get into a daily routine of spending time with Jesus. To get started with scripture writing all you need is a notebook and a pen and then determine what books, verses or even chapters of the Bible you want to focus on. You then just simply write out scripture.You can then combine this with a Bible Study Method to help you with key takeaways and practical applications. You are trying your very best to be intentional with your faith. Why feed your mind with content that go against your Christian believes? It may seem innocent but the music we listen to as well as what we watch are having its effects and the statistics are there to prove it. Instead of feeding our minds with junk, consider a family friendly alternative to Netflix, Crossflix. Crossflix provides family-friendly programs to entertain, educate and inspire you. Start a FREE 30 Day Trial Today! I love to listen to Podcast, especially doing my commute to work. It’s usually my excuse to learn something new while doing a mundane task such as driving to work. I particularly like to listen to the Titus 2 Minute by Jami Balmet as well as The Homemaking Foundations Podcast. Jami provides you with tools, inspiration and encouragement to craft a Gospel centered home. The SHE podcast is also quickly becoming a new favorite. Grow your faith, impact your community and discover products from companies that do good with a monthly Faith Box subscription. With daily devotionals and Christian books included. Look forward to a monthly Faith Box that encourage and challenge you to walk in faith daily. Looking to recharge, be intentional with your spirituality and find true rest in God? Focus on areas such as prayer and fasting, embracing nature and truly focus on serving rather than being served. Try doing a 30-day spiritual self-care challenge today! I hope you found these ideas helpful in growing your faith. You may totally miss the mark with reading the Bible in 90 days, reading the Bible in 6 months or even a 52 week Bible reading plan. If you get off track, keep reading regardless. Read the Bible at a level that works for you. What really matters is that you read the word of God and spend time developing a relationship with him. In your own timing you will successfully attain your ultimate goal of reading through the Bible from cover to cover. What are some of your best tips for beginners on how to read the Bible? I am Shanique, the creator of the blog + brand Rock Solid Faith where we provide practical tips to help young adults develop a deeper intimacy with God and live out their faith in a lukewarm Christian culture. Rock Solid Faith is a participant in the Amazon Services LLC Associate Program, an affiliate advertising program designed to provide a means for sites to earn advertising fees by advertising and linking to Amazon.com. You're resolved to read more in the new year. Here's where to start.